Grab yourself a physical copy of one of Switch's hottest games complete with a strategy guide. The Legend of Zelda: Breath of the Wild, Splatoon 2 and Super Mario Odyssey are all receiving new “starter pack” releases on September 28th, 2018. The pack includes both a physical copy of the game and a colourful strategy guide for the RRP of $59.99. All three guidebooks are themed to match the game they’re paired with and players can expect helpful hints and tips for a few of the Switch’s best offerings. For example, the “Splategy Guide” for Splatoon 2 includes information about in-game maps that can give you a competitive edge and the “Explorer’s Guide” shares a little extra lore from The Legend of Zelda series. Curiously, two of these starter packs seem to have been available before under a different name. The “Explorer’s Edition” of Breath of the Wild included the guidebook as well as a map for a retail price of $119.99. Nintendo also released a “Starter Edition” of Splatoon 2, including the game guide with sticker sheets, for $59.99 earlier this year. It seems that this may be an attempt to align the branding and pricing of similar editions going forward. 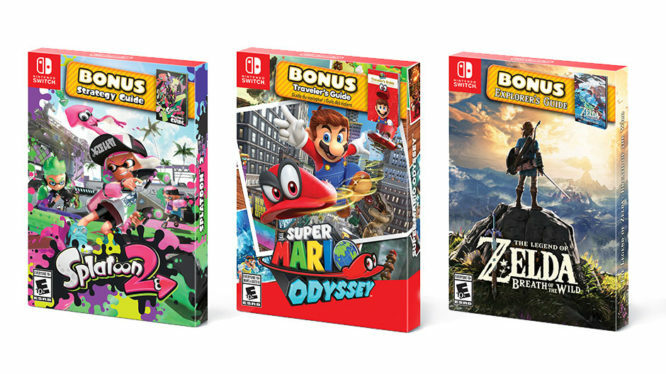 In any case, considering these bundles are priced the same as the standard editions of these games they may prove to be popular when they hit shelves on September 28th.